Kalvin Phillips celebrates his equaliser against Middlesbrough. Our fans’ panel have their say on Leeds United’s 1-1 draw at Middlesbrough on Saturday. Kemar Roofe forces Middlesbrough's Darren Randolph into a save. A draw was always going to be a good result at the Riverside and the 1-1 scoreline had been predicted by several jury members. But, after dominating the game, particularly in a one-sided second half, we are again ruing the missing of a number of gilt-edged chances that could have made this an even more impressive outcome. With double the attempts that Boro managed and four times the number of corners, Leeds really ought to have been comfortable winners. That we weren’t is down to our ongoing problem in front of goal but the good news is that this was a performance that showed we are still more than capable on our day of competing with the very best; we just need to improve our touch now and again and put those chances away. Jack Clarke looked under the weather whilst on the pitch in the first half and was clearly struggling with the pace of the game so let’s hope he’s okay after being released from hospital. Patrick Bamford takes on Middlesbrough's Daniel Ayala. Swansea on Wednesday is now very much a must-win game. Man of the match: Kalvin Phillips. The latest goal in the 100-year history of Leeds United and not a moment too soon. Kalvin Phillips’ goal will be vital in the promotion race and keeps up Leeds’ record of scoring in every away game this season. The never-say-die attitude is one of United’s greatest strengths and few teams are capable of matching it. Middlesbrough’s defence stayed resolute for most of the game, but in the end it was broken down by Leeds’s sheer determination. It was a draw that almost felt like a win, but Leeds might have claimed all three points had their finishing been more accurate. Patrick Bamford missed big chances on his return to the Riverside while Pontus Jansson hit a post. It began to look like Leeds were never going to score against the Championship’s meanest defence, but Leeds don’t give up easily. Now they must prepare for Wednesday and a winnable game against Swansea. Three points are becoming more and more essential. Leeds went back to the top of the Championship thanks to the ‘latest’ goal they have scored in scheduled time at the Riverside. United gave Boro as good as they got but once again they conceded first, Adam Wing getting the opener just after the start of the second half. There are many things you can point at this season’s squad but giving up is not one of them and with the introduction of Pablo Hernandez from the bench, they wrestled control of the game from their hosts. Balls flew across the Boro back line and only Patrick Bamford will know how he missed the chance he spurned when Pontus Jansson’s header came back off a post and into the striker’s path. There was a lengthy stop in play when youngster Jack Clarke was tended to in the Leeds technical area – the winger was taken to hospital after becoming unwell. He was later released and able to travel home. With the game going into uncharted territory, a last-ditch effort was needed. Pablo’s corner was headed into the six-yard box by Liam Cooper and Kalvin Phillips broke Middlesbrough hearts by heading home. Something has gone awry in the Leeds United support just lately. It was a good point at Middlesbrough, the sort of result that would have been lauded in years gone by. When taken in isolation, 1-1 was a decent outcome. There was a lot of angst around ticket distribution for this game. It was an allocation much larger than last year but in far greater demand. For many who were successful in getting a ticket, their time was spent moaning, shouting abuse at our players, goading the home fans or remaining totally silent. We have supported relegation-threatened Leeds sides with more gusto. This was followed by some hysterical and moronic abuse dished out to players on social media requiring Luke Ayling’s partner to wade in after some distasteful comments related to Jack Clarke’s worrying illness. On Saturday night we were top of the league after 31 matches with a run of very winnable games to come. You would have thought that United fans would be excited and ready to support the club towards the finish line. Let’s get behind them. The Riverside Stadium has not been a happy hunting ground for Leeds United in recent years, and the Teessiders were determined to put their shock midweek FA Cup exit behind them. Arguably the best chance of the first half fell to former Middlesbrough striker Patrick Bamford, who could only fire wide after a clever lay-off from Jack Harrison. The home team took the lead shortly after the restart, as Adam Wing was given too much space in the area, before neatly slotting home. Pablo Hernandez, who was introduced at half-time, injected some much-needed creativity to the attack. He replaced Clarke, who was rushed to hospital after feeling unwell on the bench, prompting a large amount of stoppage time. Throwing everything at the opposition, the Whites were rewarded in the 11th minute of injury time as Kalvin Phillips headed in from close range. This was a big result which should lift the side ahead of Swansea City’s visit to Elland Road on Wednesday. In Judaism, a boy reaching his 13th birthday undergoes a right of passage. The first time I bought my dad a pint with my own wage packet I felt it was the day when I made the transition from boy to man. 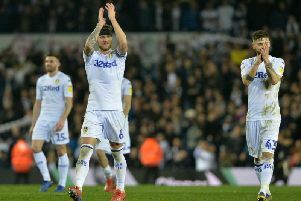 Leeds United changed, in the space between 100 minutes and 101, from a side who stepped from a team about to be branded nervy to one which looks determined and to a man, ready to stand up to the test. From the sloppy first moments of the second half, United went on to dominate at a tough ground, in a style one associates with champions. Yes, we went through the wringer. Not scoring first is becoming a weight around our necks but one has to balance anxiety with reality. We are a better footballing side than most, if not all of the sides in the league. But, the goals are drying up at one end and are slipping in at the other. However, Bamford has 90, or rather 101 minutes behind him and Roofe was getting on to channel balls that suggests Leeds will always pose a threat. Nothing is ever easy. We are destined to sit on the edge of our seats for the next three months. At some point however, as much as we have wobbled we will in turn click again. Kalvin Phillips will purr, Pablo Hernandez will conjour, Izzy Brown will appear and there might even be a game where we have things relatively easy. For now, we wish Jack Clarke a full recovery and seek out the camomile tea. The dog, by the way, has been given a bone consummate with a last-minute equaliser that kept us on track.